I have head a lot about VUCA world – what is it? 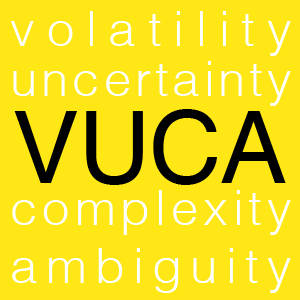 VUCA is a trendy managerial acronym that stands for volatility, uncertainty, complexity and ambiguity. The term was coined by the U.S. Army War College in the early 1990s to describe what the world after the Soviet Union’s collapse: volatile, uncertain, complex and ambiguous. 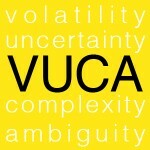 Today, VUCA is highly relevant to the business world we operate in. The content below can be related to the leadership of others, as well as to self-leadership. The primary function of any leader is to point the way ahead. But doing so in VUCA environments is harder than normal. Leaders need to see what others yet don’t. But the more VUCA an environment, the harder it is for leaders themselves to comprehend the situation. The challenge for individuals and managers alike is to find “anchors” that will allow them to survive and thrive in a VUCA world. These “anchors” are vision, understanding, clarity and agility. Volatility is alleviated by vision, a defined mission statement of where an organisation is heading. When confronted by volatility, leaders must communicate clearly and make sure their intent is understood. Individuals need to create a vision of their own futures; this allows them to live with purpose. Uncertainty yields to understanding, the ability to stop, look, and listen. If an individual has a clear vision, he can begin to determine what is important to him, what his priorities are. The same can be said for businesses. Complexity succumbs to clarity, the effort to make sense of the chaos. Reflection that leads to vision and understanding, then allows individuals and leaders to look objectively at the world; to clearly see strengths, weakness, opportunities and threats. We are bombarded with information, not all of it true. Individuals and leaders need to sort through that external data and look inwards to understand their purpose in life; their value proposition. This is the ability to know what you want, who you want to be and where you want to go at all times, even when multiple ways to get there are available to you. Leading in turbulence demands the ability to utilise all areas of your mind. Even the most impressive minds can fall short in a VUCA world — it takes equal parts cognitive, social, emotional, spiritual, and intelligence to overcome turbulence. This means the responsive and resilient ability to skilfully balance and right yourself, and ride out turbulent forces that you cannot avoid. It means being open to change, learning from mistakes and always looking forward. The days of one “great leader” are gone. In the VUCA world, the best leaders are the ones who harness leadership from everyone and work as a team. At the end of the day, we are human and possess only so much intellectual and emotional energy. To succeed in a VUCA world, we must expend that energy in the areas that produce the best results. In short, in a VUCA environment our first priority must be developing and articulating a clear vision to drive actions. The clearer leaders can be about what they want to accomplish, the better their organisations will perform in the volatility, uncertainty, complexity, and ambiguity of today’s global business environment.